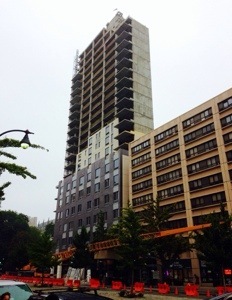 One Morningside Park in Harlem taking shape | HarlemGal Inc.
Harlem real estate continues to amaze me. 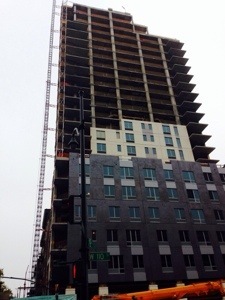 Development continues even though the entire world feels like a quagmire, with the exception of Manhattan real estate. Look at this building in Harlem on the corner of 110th Street and Manhattan Avenue, which was an abandoned lot! 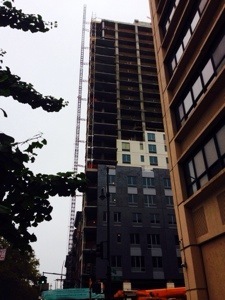 It’s going up so fast and there’s not very many apartments left-unless one has a million dollars. Look at One Morningside Park’s listings! All that’s left to purchase are apartments for $1.2 to $2.2 million. And there’s no guarantee those million dollar apartments have Central Park or Morningside Park views. My guess is those apartments with great park views went first. With this apartment building going up in this former abandoned lot, can we all agree now that Harlem is one expensive place to buy real estate? Long gone are the days of reasonable apartment deals in Harlem. This entry was posted in 110th Street, apartments, commercial real estate, Harlem, Harlem bloggers, Harlem blogs, Harlem commercial real estate,, HarlemGal, Morningside Park, real estate and tagged 10026, 110th Street, Apartments, Harlem, Harlem bloggers, Harlem Blogs, Harlem Real Estate, HarlemGal, Manhattan real estate, one morningside park, real estate. Bookmark the permalink. Now that Harlem has become a goldmine for Whites compared to Riverside drive and upper eastside prices these buildings will continue to go up and Minorities will continue to move out to saturate Queens, Bronx and a few spots in Brooklyn. We watch and expect our politicians to help us but in this town “Its MONEY that matters” they can’t do a damn thing! As Harlem Gal said, this was an empty lot a year ago! Just something to keep in mind when complaining about white people and gentrification. Agreed with “Anonymous #3” – some of these people need to take it down a few notches and stop complaining about white people and gentrification in general. Let’s be happy these buildings/abandoned lots are getting fixed up and bringing along services like grocery stores and neighborhood cafes we can enjoy rather than having to schlep to the UWS. No one is (nor should be) entitled to live in a particular neighborhood. It’s just the same old game of people being priced out of Tribeca to relocate to the UWS, to the UWS’ers being priced out and moving to South Harlem, etc… It’s all up and down the economic ranks.